Fellow coast-to-coast Svengoolie SvenPals will be jumping for joy for his upcoming showcase of a classic 1935 Universal Studios monster entry. Theatrical trailer for “Werewolf of London” (1935). Note: This was altered for the later Realart re-issue of the Universal monster classic. The legendary Chicago/Berwyn-based horror film host will showcase “Werewolf of London” (1935), this Sat., June 2 at 8 p.m. Eastern/7 p.m. Central on Me-TV. “Werewolf of London” (1935) was directed by Stuart Walker. That same year, Walker also directed a musical comedy for Universal, titled “Manhattan Moon” (1935, with Ricardo Cortez, Dorothy Page and Regis Toomey). Walker also served in uncredited roles as producer and associate producer for the later “Bulldog Drummond” series of mystery films at rival studio Paramount Pictures from 1937–39, according to IMDB. Walker’s 1935 Universal horror entry served as the precursor to the studio’s later series of “Wolf Man”/werewolf-themed monster franchise films; including George Waggoner’s “The Wolf Man” (1941, with Lon Chaney Jr., Bela Lugosi, Claude Rains, Ralph Bellamy, Evelyn Ankers, Warren William and Patric Knowles). This will mark Sven’s sixth showcase of “Werewolf of London” (1935) on Me-TV. He previously showcased the film in Oct. 2012, Feb. 2013, Sept. 2014, Jan. 2016 and March 2017.
Who was in Walker’s Universal “werewolf” monster feature? 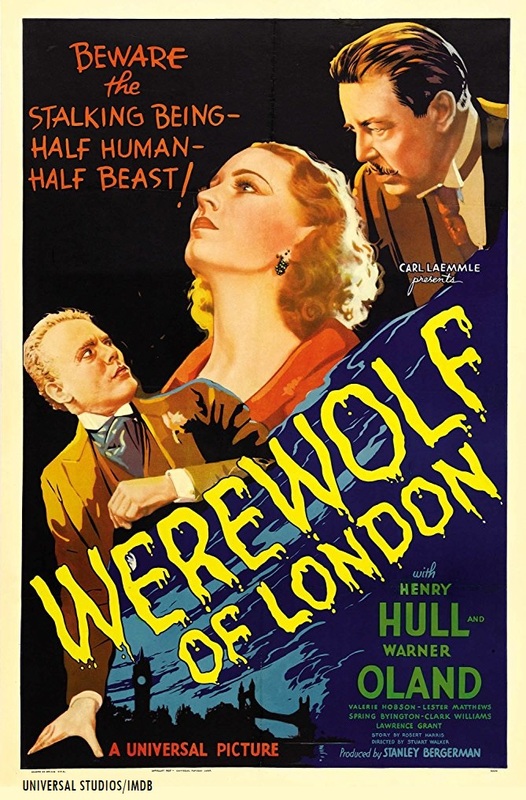 The actors who appeared in “Werewolf of London” (1935), were Henry Hull (as Dr. Wilfred Glendon), Warner Oland (of “Charlie Chan” fame as Dr. Yogami), Spring Byington (as Ettie Coombes), Valerie Hobson (as Lisa Glendon), Lawrence Grant (as Sir Thomas Forsythe), Lester Matthews (as Paul Ames), Clark Williams (as Hugh Renwick), J.M. Kerrigan (as Hawkins; Kerrigan would be later cast in the role of Charles Conliffe in 1941’s “The Wolf Man”), Charlotte Granville (as Lady Forsythe), Ethel Griffies (as Mrs. Whack), Zeffie Tilbury (as Mrs. Moncaster) and Jeanne Bartlett (as Daisy). 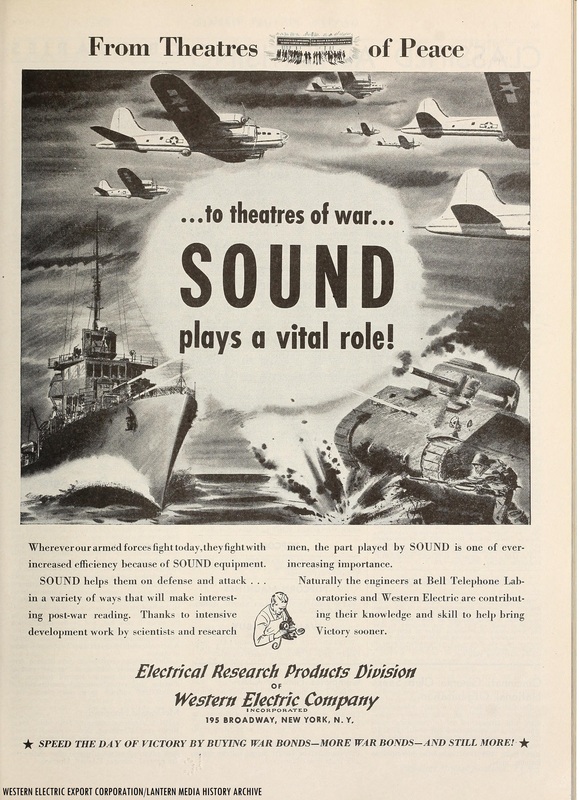 1944 Western Electric/Bell System advertisement for developments in the company’s motion picture sound and telecommunications equipment used for defense by the United States Armed Forces during World War II. Fellow Svengoolie SvenPals and those that missed out on his Feb. showcase will be interested in the return of a cult arachnid telefilm feature. A snippet from “Tarantulas: The Deadly Cargo” (1977). DVD cover art for the FremantleMedia/Direct Source release of “Tarantulas: The Deadly Cargo” (1977). 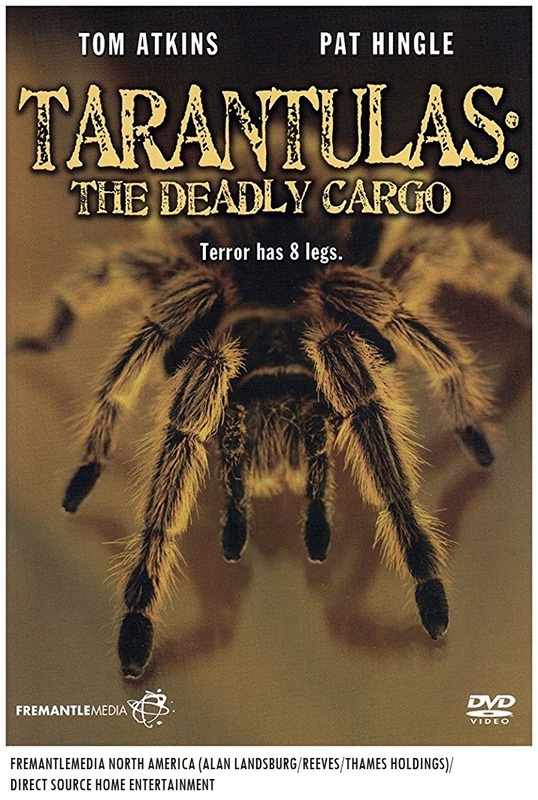 The beloved Chicago/Berwyn-based horror/sci-fi/thriller film host will present his second showcase of the Alan Landsburg– Stuart Hagmann– Guerdon Trueblood arachnid telefilm thriller, “Tarantulas: The Deadly Cargo” (1977); this Sat., May 26 at 8 p.m. Eastern/7 p.m. Central on Me-TV. Who was in Hagmann’s made-for-TV thriller? The players who appeared in “Tarantulas: The Deadly Cargo” (1977) were were Claude Akins (of “B.J. and the Bear”/ “The Misadventures of Sheriff Lobo” fame, as Bert Springer), Howard Hesseman (of “WKRP in Cincinnati” fame as Fred), Deborah Winters (as Cindy Beck), character actor Pat Hingle (as Doc Hodgins), Tom Atkins (of “Night of the Creeps” fame as Buddy), Charles Frank (as Joe Harmon), Bert Remsen (as Mayor Douglas), Sandy McPeak (as Chief Beasley), Penelope Windust (as Gloria Beasely), John Harkins (as Sylvan), Bill Erwin (as Mr. Schneider). Steve Bonino as “Spud” and Matthew Labyorteaux (as Matthew Beck). Fellow coast-to-coast Svengoolie SvenPals will be excited about his upcoming coast-to-coast premiere presentation of a Columbia Pictures sci-fi/fantasy creature classic. The iconic Chicago/Berwyn-based sci-fi/horror film host will present his big coast-to-coast broadcast premiere of “20 Million Miles to Earth” (1957), this Sat., May 19 at 8 p.m. Eastern/7 p.m. Central on Me-TV. “20 Million Miles to Earth” was directed by veteran film director Nathan H. Juran. The stop-motion creature sequences were done by veteran visual effects pioneer Ray Harryhausen, the father of “Dynamation”/”Dynarama.” The Juran-Harryhausen feature was produced by Charles H. Schneer. The screenplay was written by Robert Creighton Williams and Christopher Knopf; Williams and Knopf’s screenplay was based off Charlotte “Charlott” Knight‘s story. 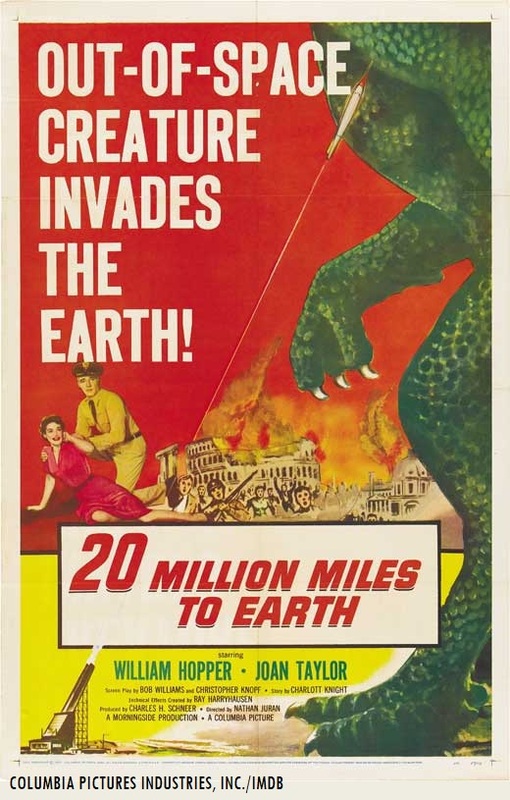 Who was in “20 Million Miles to Earth” (1957)? The players who appeared in the 1957 Juran-Harryhausen Columbia creature feature were William Hopper (as Col. Robert Calder), Joan Taylor (as Marisa Leonardo), Frank Puglia (as Dr. Leonardo), John Zaremba (as Dr. Judson Uhl), Tom Browne Henry (as Maj. Gen. A.D. McIntosh), Tito Vuolo (as Commissario Unte), Jan Arvan (as government official Signore Contino), Arthur Space (as Dr. Sharman), young Bart Braverman (as Pepe, Braverman was credited as Bart Bradley in the film), William Woodson (who was uncredited for his opening narration) and a cameo appearance by Ray Harryhausen (in an uncredited role as a man feeding an elephant). Fellow classic film enthusiasts from coast-to-coast will be interested in an upcoming re-release of one of the definitive Billy Wilder film classics. Turner Classic Movies, in conjunction with Paramount Pictures and Fathom Events will present the coast-to-coast revival screening of Billy Wilder’s “Sunset Boulevard” (1950) in select cinemas on Sun., May 13 (Mother’s Day) with an encore screening on Wed., May 16 at 2 p.m. and 7 p.m. (local time). This is part of the network’s “Big Screen Classics” series of vintage feature film revival presentations. The screenplay for “Sunset Boulevard” was written by Wilder, Charles Brackett and D.M. Marshman Jr. The TCM “Big Screen Classics” showcase of Billy Wilder’s “Sunset Boulevard” (1950) will also feature pre-recorded opening introduction and closing conclusion segments by TCM host Ben Mankiewicz. Who was in “Sunset Boulevard” (1950)? The players/personalities who appeared in Wilder’s classic were Gloria Swanson (as Norma Desmond), William Holden (as Joe Gillis), Erich von Stroheim (as Max von Mayerling), Nancy Olson (as Betty Schaefer), Jack Webb (of “Dragnet” fame, as Artie Green), Cecil B. DeMille (as himself), Hedda Hopper (as herself), Buster Keaton (as himself), Anna Q. Nilsson (as herself), H.B. Warner (as himself), Ray Evans (as himself), Jay Livingston (as himself), Fred Clark (as Sheldrake), Franklyn Farnum (as the undertaker), Robert Emmett O’Connor (in an uncredited role as Paramount studio guard Jonesy) and John Cortay (in an uncredited role as Paramount studio guard Mac). Billy Wilder’s feature won three Academy Awards in 1951 for best writing, story and screenplay (Wilder, Brackett and the junior Marshman); best art direction/set decoration for a black-and-white feature film (Hans Dreier, John Meehan, Sam Comer and Ray Moyer) and best music score of a dramatic or comedy feature (Franz Waxman). Wilder’s “Sunset Boulevard” was also honored with three 1951 Golden Globe awards for best performance by an actress in a dramatic motion picture (Gloria Swanson), best motion picture director (Billy Wilder) and best original motion picture score (Franz Waxman). Fellow Svengoolie SvenPals everywhere will be jumping for joy about his upcoming coast-to-coast premiere of a landmark sci-fi/horror classic from 1958. Theatrical trailer for “The Blob” (1958, altered for later re-issues to capitalize on Steve McQueen’s success). The iconic Chicago/Berwyn-based horror film host will present his national television premiere of “The Blob” (1958), this Sat. ; May 12 at 8 p.m. Eastern/7 p.m. Central on Me-TV. 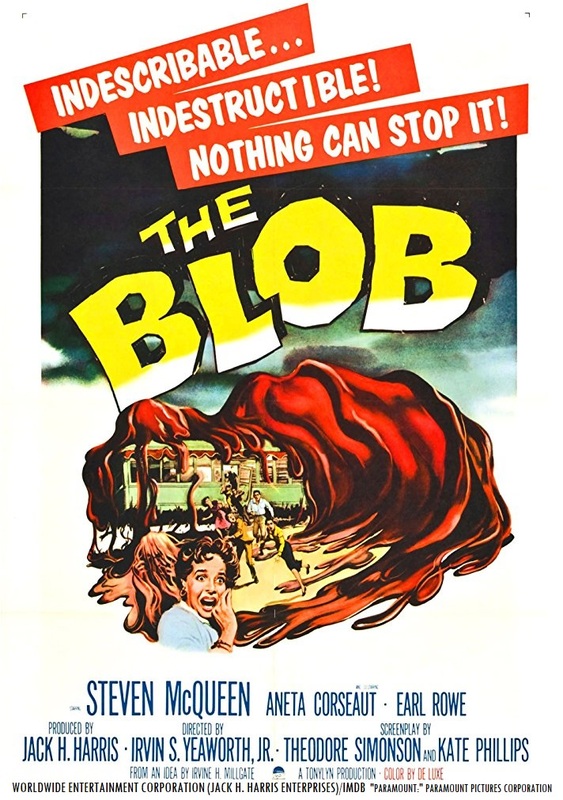 “The Blob” was directed by Irvin S. Yeaworth Jr. and was produced by Jack H. Harris. Yeaworth and Harris’ production (under the Tonylyn Productions moniker) was released theatrically by Paramount Pictures in 1958 (according to IMDB). Who was in “The Blob” (1958)? The players who appeared in “The Blob” (1958) were Steve McQueen (as Steven Andrews, McQueen was credited as “Steven McQueen” in the film), Aneta Corsaut (as Jane Martin, Corsaut was credited as “Aneta Corseaut”), Earl Rowe (as Lt. Dave), Olin Howland (as an elderly man, Howland was credited as “Olin Howlin”), Stephen “Steven” Chase as Dr. T. Hallen, Lee Payton (as Nurse Kate), John Benson (as Sgt. Jim Bert), George Karas (as Officer Ritchie), Elbert Smith (as Henry Martin), Vince Barbi (as café owner George), Audrey Metcalf (as Elizabeth Martin) and Hugh Graham (as Mr. Andrews). Fellow Svengoolie SvenPals and science fiction aficionados will be excited about an upcoming presentation of a classic Columbia Pictures sci-fi masterpiece. Original Columbia Pictures theatrical trailer for “Earth vs. the Flying Saucers” (1956). 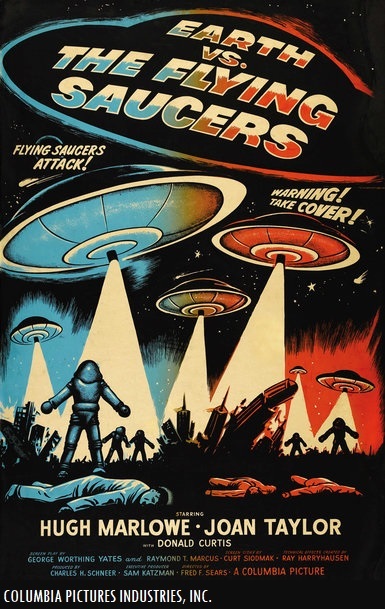 Original Columbia Pictures poster art for “Earth vs. the Flying Saucers” (1956). The legendary Chicago/Berwyn-based horror film host will present his coast-to-coast premiere of “Earth vs. the Flying Saucers” (1956), this Sat., May 5 at 8 p.m. Eastern/7 p.m. Central on Me-TV. “Earth vs. the Flying Saucers” (1956) was directed by actor-director Fred F. Sears, who also worked on Columbia’s smash rock-and-roll revue feature, “Rock Around the Clock” (1956, featuring Bill Haley and the Comets, The Platters, disc jockey Alan Freed and the Ernie Freeman Combo). Visual effects pioneer Ray Harryhausen worked on the special effects for “Earth vs. the Flying Saucers.” This was Harryhausen’s second Columbia visual effects feature; he previously worked on visual effects sequences for Robert Gordon’s “It Came from Beneath the Sea” (1955). Bernard Gordon and George Worthing Yates’ screenplay was inspired by United States Marine Corps Maj. Donald E. Keyhoe’s 1953 account on flying saucers, “Flying Saucers from Outer Space.” Bernard Gordon was credited under the pseudonym of “Raymond T. Marcus” due to Gordon’s name being blacklisted (according to IMDB’s trivia section on the film). Who was in “Earth vs. the Flying Saucers” (1956)? The players who appeared in the Sears/Harryhausen Columbia sci-fi feature were Hugh Marlowe (as Dr. Russell A. Marvin), Joan Taylor (as Carol Marvin), Donald Curtis (as Maj. Huglin), Morris Ankrum (as Brig. Gen. John Hanley), John Zaremba (as Prof. Kanter), Grandon Rhodes (as Gen. Edmunds), Tom Browne Henry (as Vice Adm. Enright), Larry J. Blake (as a motorcycle cop), Fred Aldrich (in three uncredited roles as an airline passenger, an Air Command intelligence officer and a man in the saucer attack) and veteran voice-over artist Paul Frees (in dual uncredited roles as the narrator and the voice of the alien).